Just how weak, by historical standards? 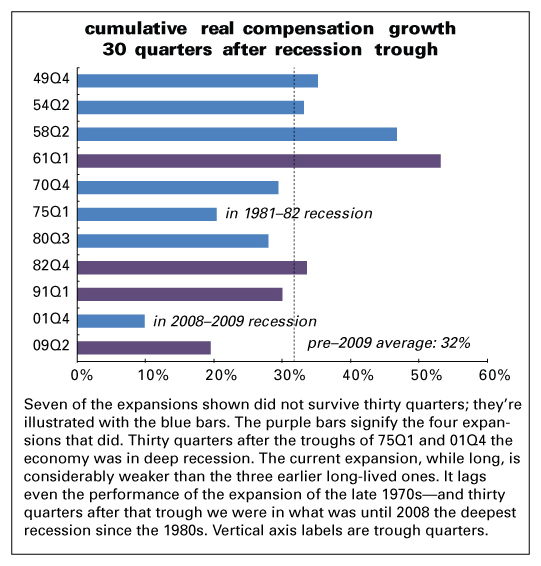 As of 2016Q4, total real compensation was up 19.5% from the end of the recession in 2009Q2. This is the second-weakest performance for the 30 months after the end of a recession, coming in behind the previous expansion. But the major reason the previous cycle’s number was so weak is that 30 quarters after it began landed it in the heart of the Great Recession. Similarly, the weak performance 30 quarters after the 1975Q1 trough can be explained by the fact that it too was in the deep 1981–1982 recession. Of the expansions that lasted 30 quarters or more (the purple bars), the post-2009 performance is the weakest. All the others had recessions and subsequent recoveries within the 30-quarter period.